Shriekwind Bastion is a small Nordic ruin overlooking Falkreath to the north. It is inhabited by vampires and skeletons. The ruin has two separate entrances with separate map markers; namely North Shriekwind Bastion and South Shriekwind Bastion. Finding both entrances count as two separate locations for the "Locations Discovered" statistic. 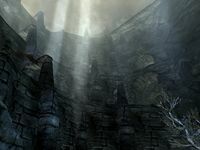 It contains one internal zone: Shriekwind Bastion and a third external zone, in addition to those found by both entrances: Shriekwind Overlook. 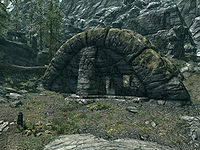 There is no path leading from the nearby road that runs along the southern shore of Lake Ilinalta, however the covered entrance can be seen from the road. You may encounter two skeletons that roam this section of road. A large stone arch forms an open antechamber in front of the entrance, which consists of an unlocked metal gate and an iron door at the bottom of a short flight of stairs. To the left is a flight of stairs that above the antechamber and further up the mountain. At the top of the first flight of stairs, on a ledge to the left is a bird's nest containing a rock warbler egg. At this point the path splits with the main trail going left, while to the right, directly over the entrance are more stairs climbing to a terrace with an unlit brazier at the far end. Inside is a random potion of healing, a random empty soul gem and an honed ancient Nord war axe. 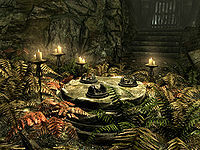 There is a second Nord war axe and a pair of ancient Nord boots beside the brazier. The main trail passes under a square arch formed by a stone being placed atop two upright stones a few paces apart, before circling around and above the first terrace. Near the top, under a low arch is a novice-locked chest. Above the chest reached by climbing another flight of stairs on the left is a lookout point, which provides a good view of the lake, northern Falkreath hold and to the northeast you can see parts of Bleak Falls Barrow. West of the entrance, down the side of the mountain, there is a corundum ore vein. Following the road from Falkreath towards Helgen, turn left just after the last tree on the left before you reach the bandit's boulder trap that spans the road a short distance south of Pinewatch. The path leads up the mountain to the first terrace. Nearby the start of the terrace is a leveled animal. Stairs lead up to a terrace with a leveled draugr slumbering in a horizontal sarcophagus in an alcove on the right. Past this stairs lead down, with more opposite leading back up again. To the left of those that lead back up are more that descend to another lower terrace where a skeleton is patrolling near a stone hut that contains many candles. At the far end is an unlocked chest resting on a fallen section of masonry. Climbing the stairs to the terrace above leads to another draugr standing in front of another sarcophagus, at the top of a flight of stairs. To the left of these is an iron door leading into the interior. You may exit this door if you've entered to the north. The entrance at North Shriekwind Bastion leads to a wide brightly lit passage with novice-locked double-iron doors at the far end. There is a leveled vampire either by the doors or sitting in a circular room on the right. In the room, by one of several chairs is a bucket containing twelve loose septims and an iron dagger. Against the rear wall is a sideboard holding two helmets; one iron and one random, a banded iron shield, a random pair of gauntlets, a woodcutter's axe, with a random pairs of boots to the right and an unlocked chest to the left. To the right of the doorway in a small alcove at eye-level on the wall are two iron swords, with a kettle full of skulls below them. 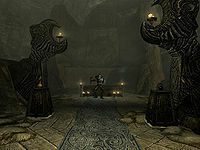 Through the doors is a large room containing a few large urns, an empty throne to the left and a dead bandit next to a stone altar with a random poison on top. The bandit is on a circular section of floor under a shaft with a trap door above and spears that shoot from the sides of the shaft. On the west wall is a chain that triggers the floor to rise and the spears to shoot from the wall. To the south is a doorway into an overgrown hallway containing a skeever, with a series of flights of stairs leading up to an iron door. This door leads into some catacombs with two skeletons at the top of some stairs around the corner to the right. There are a number of empty coffins found in alcoves along the walls. At the top of the stairs a doorway leads out into a large open area with the trapdoor seen previously in the center. There is a plinth beside it, with a handle in the top, which activates the same trap as before. In the corner is a large tree and against the north wall are stairs leading up to the first of several pathways rising in terraces around the room. There are a couple of skeletons found on each of these levels. Depending on your skill with a bow, you may be able to clear most, if not all these skeletons from ground level. Climbing the long flight of stairs leads up to the first level where two skeletons are on guard. At the far end is an iron door leading into a small area of catacombs with more empty coffins and a couple of burial urns. A doorway leads into a semicircular room with two doorways on the right-hand wall both leading to the same passage, separated by a blood-soaked raised section with several skulls and a random potion of healing on top. Beside this is a basket of skulls and another random potion of healing. On your left as you enter the room is a set of shelves holding an iron dagger. On the left is an unlocked chest and a large urn and in an alcove opposite the entrance are a large number and variety of shoes and boots. The passage leads to a small wet area with natural light filtering from above, eight hanging moss growing down the walls and from a beam. There is a lowered gate opposite and a chain on the right which raises the gate. The room beyond contains two skeletons and is overgrown with vegetation. In the center on a block of stone are three handles, with two doorways, both blocked by gates; a larger one to the north and a smaller one with two more skeletons behind to the southeast. There is also a concealed door to the east. These can be dealt with using a fire rune as close to the gate as possible. The handle furthest from the small doorway opens it, the one to the east opens a concealed door on the east wall with a small area behind and an open upright coffin containing an iron helmet and random gauntlets. The final handle to the southwest opens a concealed door on that wall where another upright, open coffin contains a random heavy armor cuirass. Through the smaller doorway is a small room containing an apprentice-locked chest with three chains above. The left-hand chain is the chain you want, as it operates the larger gate to the north. The right-hand chain operates the gate between the three handled room and the wet room and the center chain operates the gate between the three-handled room and this room. Continue through the large gate and follow the corridor around to the left, where several more hanging moss are growing from the walls. There is a skeleton ahead, just out-of sight and three dead skeletons lying on the floor beyond. These can be looted and beside them is an iron dagger, helmet and shield. The passage beyond the skeletons has two pressure plates down the middle of the floor, both triggering battering rams, the first from the ceiling behind you and the second the ceiling in front. This passage leads out onto the second level of the large area. There are two more skeletons on this level unless dealt with from below. At the far end another passage heads away from the open area, before a couple of turns lead into a narrower passage and a doorway on the left enters a torture chamber with a vampire's thrall sitting on a throne on the right. The floor is awash with blood, which makes seeing two large rubies, and a flawless ruby, that are found on the floor, difficult to see. There are two torture racks and small cage hanging from the ceiling, which contains a burnt corpse. To your left is a chain that triggers a flame spout trap to shoot up from the floor and continue burning this corpse. Opposite the entrance a passage continues up a flight of stairs to a corner with a chair in front of a fireplace and another doorway into a wider passage heading west. On the far wall is a doorway into a small alcove with a random enchanted greatsword, a random helmet and a pair of random boots. These are all in front of another concealed door, which is opened with a chain just inside the entrance, which will open a passage to the entrance at South Shriekwind Bastion. Climbing the stairs to the west brings you to another overgrown area and an open door into a passage heading east. On your right is a cave-in and either side empty coffins. The passage leads out onto the top walkway of the open area, with another skeleton unless previously dealt with and stairs on the left. Follow the walkway to the far end, where you will find a wide passage with a plinth with a handle in the top by the start, several burnt corpses along the length and a doorway blocked by a gate. If you pull the handle the gate will rise, however flamethrower statues along the length of the passage will also start. There is an alternative, look just to the right of this handle. There is a chain on the inside of the passage, which only raises the gate without triggering the flamethrowers. Through the doorway is a flight of stairs leading up to double doors. Through these is a boss level vampire standing beside stairs leading up to a brazier that appears filled with blood, with a random potion or poison on the ground beside it and a copy of the Speech skill book 2920, Second Seed, v5 on a piece of fallen masonry. At the top of the room is a circular passage around a central stairwell, with an unlocked chest and three burial urns against the outside wall and a fourth burial urn against the inner wall. There is a wooden spiral staircase rising to a short passage and a large room with a row of large statues on either side and a sarcophagus in front of the word wall at the far end. As soon as you enter this room the sarcophagus will burst open and a draugr magic-user will emerge. Between the first and second statues on the right is an unlocked chest. In front of both the last statues are two plinths with random potions or poisons on weight sensitive plates, but these don't seem to trigger anything adverse. Approach the word wall to learn a word for the Elemental Fury dragon shout. It is possible to reach this balcony by mountain climbing, avoiding the need to completely traverse the interior to reach the word wall or complete any quests here. The balcony is a small look out point devoid of anything interesting apart from the view. It is on the northwestern side of the mountain far above both of the entrances. There is a dead wood cutter a short distance to the east of the northern entrance. After using the handles to get through the gate to the main chamber, your follower may get stuck and will not rejoin you until you leave the tomb. A way to make them rejoin you is to walk a corridor or two past the plates, then wait one hour. They will 'respawn' next to you. They will also rejoin you when you change zones (e.g. if you exit the ruin). You can also use the Unrelenting Force shout to knock them loose and they will then follow you. Followers seem to have problems navigating the passages leading to/from the various terraces in the large open area, constantly heading back to the lowest level for each subsequent walkway. This page was last modified on 13 April 2019, at 20:11.